An installation is constructed in the furthest and most private section of the Alexander Palace Gardens in Tampere. A gravel path runs from a corner of the boundary to the main entrance of the gardens, and is fringed by and avenue of trees. 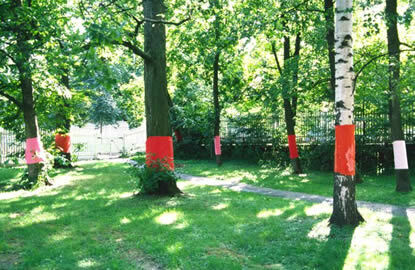 These trees are bound and dressed in pink and red cloth, this being appropriated from Balinese cultural-religious practice. I wear an ornate black lace brocade kebaya with black sarong and am barefoot. Beginning at the external boundary end of the path, and moving backwards with my back to the audience, I begin to ‘sweep’ the path with a traditional Balinese broom. I’m wearing a discman, the sound of which is only audible to me. The audience hears only the sound created by the rhythmic and repetitive brushing of the hard ground as I make my way up the path. The performance takes about an hour and concludes when I have completed the ‘work’ of sweeping the path. The work draws on common icons and practices from Balinese culture - my costume, the dressed trees, the broom and sweeping of ground. While these cues may not be completely discernible to the audience, they no doubt refer to a place distant both geographically and culturally from Finland, ‘exotic’. 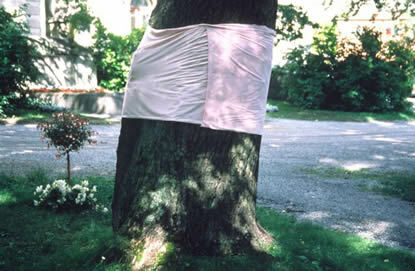 The dressing of the trees is intended to embody the trees with personal meaning and to delineate a space for the performance. It is derived from the Balinese custom of ‘dressing’ trees to mark them as sacred or within the vicinity of a place to pray. Wearing semi-traditional dress evokes a sense of ritual, the black can refer to ceremonial/formal dress in the Western sense especially of the performer: this is a performance festival. The sweeping of ground is common practice by women in Bali. Despite the cues and clues for the audience however, the sweeping of hard gravel ground may seem a ludicrous act. A tangible sense of ‘distance’ is further heightened by the fact that my performance is connected to an audio that only I can hear. This physical distance, which leaves the audience out of reach of any pattern or rhythm that might be driving my movement then acts as a metaphor for the felt distances between cultures and their specific codes.